In Santa Cruz, California a much-beloved community garden, tended by immigrant gardeners for 23 years, has been reduced to half its size, with the future of even the smaller plot in doubt. The fight to save the garden has galvanized progressive Santa Cruzans, many of whom seem to be in this for the long haul. Even if insignificant in the larger scheme of things, this campaign has much to teach us about how different forms of injustice converge and about how to confront the environmental racism in our midst. Santa Cruz is a city of 62,000 on the central California coast, known for its University of California campus (unofficially, the “alternative” UC campus), its surfing culture, its coastal and forest scenery, its restored Spanish-era mission and its Beach Boardwalk, one of the Pacific Coast’s oldest and most popular beach amusement parks. The Boardwalk is owned by the Santa Cruz Seaside Company, a 101-year-old local business that also owns a hotel, a motel, a bowling alley, car dealerships and rental properties. Beginning with the founding of the University of California Santa Cruz in 1965, the city has had a reputation for progressive politics, so much so that it was the subject of a book by UCSC sociologist G. William Domhoff titled The Leftmost City. Although the heady days of leftist city councils may now be over, it is still safe to say that many Santa Cruzans value diversity, strict limitations on development, and sustainability. Santa Cruz is a majority white town, with one neighborhood that stands out demographically. Beach Flats, bordering the Boardwalk’s enormous parking lots, is populated mainly by immigrants from Mexico and Central America. Its 1700 residents are relatively poor, many are undocumented, and the crowded Beach Flats housing affords little space for the yards that most Santa Cruzans take for granted. Not surprisingly, Beach Flats has a history of tense relations with the local police, and city support for the community has had its ups and downs, mostly downs, over the years. Because it adjoins the Boardwalk, Beach Flats also has an intimate relationship with the amusement park. Residents are forced to cope with the Boardwalk-related noise, traffic and partying, especially during the summer months. And the Seaside Company owns about half of the land within Beach Flats. Twenty-three years ago Seaside agreed to lease the City of Santa Cruz a small chunk of land they owned within Beach Flats for a nominal annual amount. This plot had been best known for the junk people dropped off there. Together with a dedicated group of Santa Cruzans, the City’s Parks and Recreation Department converted the space into a community garden. Until February of this year, the Beach Flats Community Garden (BFCG) occupied 26,000 square feet (0.6 acres), the only significant green space in Beach Flats. The 20 current gardeners are all Spanish-speaking immigrants, the older ones from Mexico, the younger from El Salvador. The BFCG is more like a farm than a typical community garden since it is an important source of food for the gardeners, their families and some of their neighbors. The gardeners have also brought unique Mexican and Central American farming traditions and plant varieties to an area where there is already a great deal of interest in alternatives to conventional agriculture, not only among local farmers but also on the UCSC campus. Because of the class-based and cultural gap that exists between more privileged Santa Cruzans and the residents of Beach Flats, it is possible to live in the city for years and know nothing of the BFCG, let alone visit it. But a small group of residents from other parts of town has always been involved, sometimes as researchers, sometimes as advocates, sometimes as gardeners themselves. In spite of its isolation, the BFCG clearly represents values that most Santa Cruzans rank highly: cultural diversity, sustainability, environmental justice, and the availability of healthy food. In the spring of 2015, the Parks and Recreation Department sent letters to the gardeners, informing them that the land would be turned over to the Seaside Company when the lease expired in November 2015. By summer a small coalition had formed to preserve the garden, and the city returned with an alternate plan, presented at a public meeting in the Beach Flats Community Center that September. This plan would create a permanent, but significantly smaller, garden in a different location. The center was packed with gardeners, Beach Flats residents, and supporters from other neighborhoods. The plan was roundly and angrily rejected. Everyone in the room, except the uncomfortable city officials sitting in front, agreed that the garden should stay put in its current form. The threat to the BFCG touched a nerve in Santa Cruz. After the September meeting, which was widely publicized, the coalition that had formed in the summer attracted a number of new people, including myself. The Save the Garden Coalition holds regular weekend meetings in the garden. Because most of the gardeners are monolingual Spanish speakers, the meetings are bilingual. 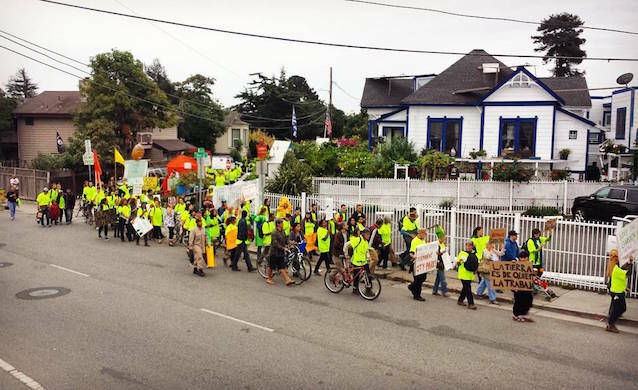 The City Council put the future of the BFCG on the agenda for its October 27 meeting, and the coalition organized a march of nearly 250 people from the garden to City Hall for the meeting. A spokesman for Seaside spoke first, presenting a new plan, by which the company would take possession of 40% of the garden and renew the lease for three more years on the remaining 60%. He said there was no question of a permanent garden on any of the space since the land was not for sale. After speaking, the representative left the meeting, so he missed the public comment from around 20 gardeners and supporters, all arguing (often eloquently and from a wide array of perspectives) in favor of preserving the whole garden. The City Council then passed a confusing resolution that committed them to “negotiate with the goal of acquisition of the current Beach Flats Garden property to allow it to continue permanently as a community garden.” The 40% of the garden that Seaside wanted immediately included the plots of several of the most active gardeners, five fruit trees and at least 50 nopal cacti. Since the 60% to be redivided among the gardeners included a large community meeting space and a shed, in fact Seaside planned to take at least half of the cultivated portion of the garden. An ensuing series of City Council and Planning Commission resolutions and statements made it clear the city had been on board with Seaside’s 60/40 plan from the start. In early January 2016 the gardeners were sent letters, asking whether they wished to continue gardening within the reduced garden. Those with space in the 40% destined for Seaside were told to vacate that area. Deadlines for both the return of the letters and the vacating of the 40% passed without a response. After weeks of discussion, the coalition decided it would fight to retain 100% of the garden rather than accept the city’s plan. This was the position of all but one of the gardeners who had been involved in the meetings, including those whose plots were within the 60% that was not to be lost. On January 25, the gardeners took the brave step of delivering a letter signed by 17 of them to the Parks and Recreation Department saying they wanted to continue gardening but would not sign the department’s letter, which would force them to give up part of the space. In late January the City Council voted in a closed session to stand firm, negotiating the terms of a lease with Seaside for 60% of the garden, which would be allotted to the single gardener who had returned the city’s letter and to other interested residents, with no preference given to the rest of the gardeners. On February 9 the coalition organized another march from the garden to City Hall to support the gardeners’ stand. This time more UCSC students participated, which had the effect of radicalizing the chants when the marchers reached City Hall. However, the march was ignored by the conservative local newspaper and had little immediate effect. Finally, threatened with lawsuits by the city manager, the majority of the gardeners negotiated an agreement with the city on February 15, consenting to vacate the 40% that Seaside was demanding. In return the city agreed to grant the current gardeners priority for plots in the reconfigured remaining 60% and to move the fruit trees and cacti growing in the 40%. Then, without any warning, Parks and Recreation bulldozers showed up on the property on March 24 and began knocking down the trees and cacti on the 40%. By the time outraged gardeners and supporters had assembled and contacted city officials, many plants had been destroyed. The city apologized for this “mistake” and agreed to compensate the gardeners for the loss, but few believed their version of what had happened. The April 26 City Council meeting took place six months after their resolution in favor of a permanent garden, at which time a report was to be made on progress negotiating with Seaside to purchase the land. The coalition chose this day for a third march to City Hall to show that they had not forgotten what had been promised. Again speaker after speaker made the case for the preservation of the whole garden, including the use of eminent domain if necessary. If anyone had had any illusions that the City Council really cared about the garden, the gardeners, and the larger Beach Flats community, those illusions were quashed that evening. Instead the City Council used the occasion to announce that a lease with Seaside had finally been signed, including an escape clause for the company: if they were not granted the use permit they needed for the reclaimed 40% of the property, they could back out of the lease! The possibility of eminent domain was rejected by all but the garden’s single ally. For May Day, the following Sunday, the coalition and their student allies organized a further march. Billed as a March for Food Justice, it linked the garden struggle with Driscoll’s Berry Boycott, a fight for the rights of farmworkers. Although smaller than the other marches, this one took the campaign to the Boardwalk for the first time. The students delivered a letter to the Seaside Company, tying the future of the Boardwalk’s lucrative relationship with the campus to Seaside’s willingness to sell the property to the city. In June the city erected a nine-foot wooden fence separating the two sections of what used to be the BFCG. On July 7, the city’s Planning Commission met to consider Seaside’s application for a permit “to establish a private garden/landscaping area” on the newly cleared 10,000 sq. ft. of the original garden. Coalition members showed up to challenge the need for such an area in the neighborhood and to attempt to set some conditions on the permit. Following a pattern that was by now familiar, the commissioners each proclaimed their sympathy with the points made by the community before proceeding to ignore them and vote unanimously in favor of the permit. Despite the setbacks of the winter and spring, the coalition has come a long way in the year since a marginalized group of immigrant gardeners, hardly in a position to lead the fight for their right to continue gardening, joined forces with a diverse group of allies. First, there has been enormous progress in getting the word out. Through press releases, letters to the editor, op-eds, leaflets, public events and a petition signed by almost 4000 people, the threat to this wonderful local resource has attracted lots of local attention. Second, as the gardeners’ participation in meetings has grown and they have shown their willingness to challenge the city directly, it is clear that they have been empowered to some small degree. The city’s assumption that threats and bullying would cause the gardeners to accede to their demands proved naïve, and the relationship between Beach Flats residents and local government may end up forever changed. Third, the fight to save the garden has, at least for the moment, bridged two of the gaps that are part of political and social life in Santa Cruz, the one separating the majority white English-speaking community from the minority Spanish-speaking community, and the one separating the UCSC community from the city. Fourth, as demographic and cultural gaps have been bridged, so too have connections been made between disparate issues. People joined the fight for different reasons, the gardeners because of the threat to an important source of food and recreation, others because of their commitment to green space, to food sovereignty, to racial justice, to fighting climate change, to challenging corporate power over local affairs. There is a bottom line behind all of these issues, and it was inadvertently laid bare by the commissioners during their July 7 meeting. For the umpteenth time, we heard a city official say yes, it would be wonderful if the gardeners could continue to grow food in the garden in their time-honored way — but after all, the land belonged to the Seaside Company. So the fight to preserve the BFCG is a fight that ultimately challenges, in a modest local way, the very foundation of U.S. economic life, private property! At the same meeting, a commissioner blurted out a second, underlying theme of this campaign and many others like it. After she had heard coalition members relate this campaign to the fight for food justice around the world, she said yes, she understood why this mattered so much, but “you can’t expect us to solve the world’s problems.” There are two ways to respond to this statement — one by challenging, the other by agreeing. First, if the world’s problems aren’t solved locally, in places like Santa Cruz, where will they be solved? Second, if “us” means the current crop of city officials, then, yes, we obviously can’t expect these people to solve really challenging problems. Solving the real problems will require a whole new set of people, or, better yet, a whole new system. As far as a whole new set of people is concerned, coalition activists are now involved in the campaign to elect a slate of candidates for the City Council elections in November who would stand up to Seaside, invoking eminent domain in the creation of a permanent Beach Flats Community Garden, and usher in a new era in the relationship between city government and the immigrants who live on the margins of an immense amusement park. So the garden is a symbol of where this city is headed. Will private property continue to trump everything else? Or will those values that Santa Cruz thinks it stands for actually matter in the end? Save the Garden! ¡Salvemos el Jardín! Michael Gasser is a member of Solidarity in Santa Cruz, and is Emeritus Associate Professor in Informatics & Computing and Cognitive Science at Indiana University. This article will appear in the November-December issue of Against the Current. Although this protest is absolutely important and beautiful and those gardeners should have the right to their job, this is not environmental racism. Environmental racism is when minority areas are purposely contaminated and/ or have become hazardous to live in. For example, Flint Michigan, their water is being contaminated and the fed’s have said themselves that that specific incident would not be happening if they were white, but since they are predominantly African American it is.